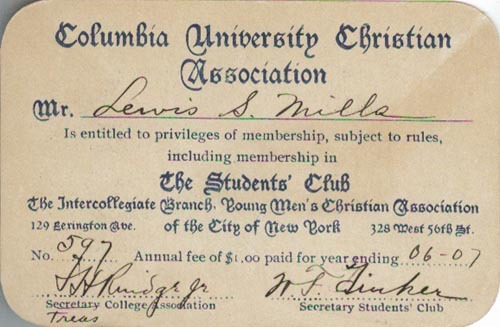 The Students' Club, The Intercollegiate Branch, Young Men's Christian Association of the City of New York, 129 Lexington Ave., 328 W 56th St.
Columbia University Christian Association, Mr. Lews S. Mills. 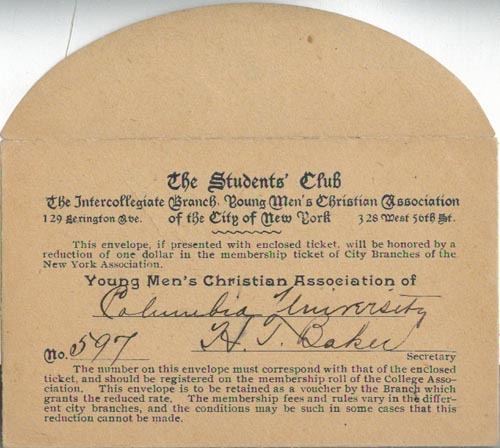 This envelope, if presented with enclosed ticket, will be honored by a reduction of one dollar in the membership ticket of Ciy Branches of the New York Association. Are you looking for MILLS ancestors? If so, we suggest posting a query to our Community Message Board to get assistance from other researchers.